When spring rains rinse and refresh the outdoors, decks, patios and everything on them get a bath, too. But, once it’s dry you see the remaining film that stays: dirt, bird droppings, sticky tree sap and buds, and whatever other debris that gets carried in the wind to land on your patio. These outdoor elements and others cause your furniture to stain, discolor and wear out much faster. * Wash it with a good cleaner at the beginning of the season and then once a week squirt it off with a hose. Both dirt and chlorine will deteriorate patio furniture. * When cleaning vinyl patio furniture, never use a harsh brush or bleach. The brush may create pores in the vinyl, damaging it and causing it to lose its shape. Plus, the bleach will deteriorate the vinyl. * Check to make sure that none of the bolts holding the furniture together are rusty. Replace them if they are, and tighten them thoroughly. * If the paint on aluminum furniture is in poor condition, rub it gently with a piece of fine steel wool or sandpaper to smooth it out. Next, take some standard car-wash polish to buff the furniture back to its original luster. * Touch up wrought-iron furniture immediately if bare metal is exposed to prevent rusting. A rust-resistant primer on the spots will help the rust from spreading under the paint. 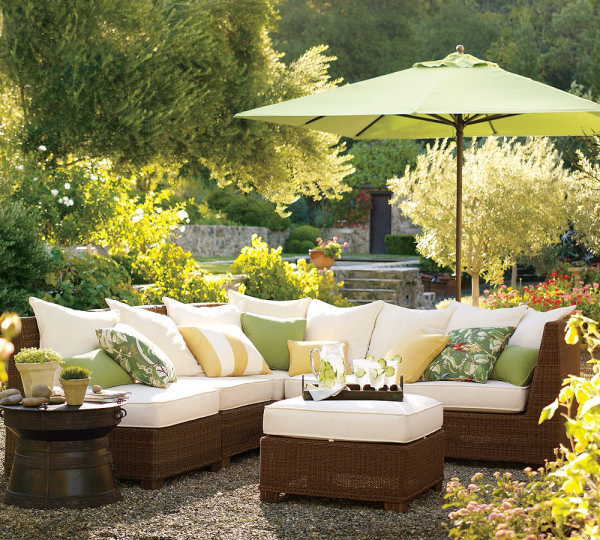 * Wicker furniture will stay looking its best if it is kept in the shade, as the sun tends to dry it out. If the wicker finish is damaged, bring it back to life by using a permanent marking pen that matches the color to blend away the exposed areas. To give a piece a whole new look, spray paint each piece with outdoor spray paint. * Don’t forget to clean your glass patio table. Remove the glass top carefully, over the grass (so it doesn’t shatter if you drop it). * Put furniture away for the winter by covering it with plastic, and storing in a dry basement or garage. If it must be kept outside, cover it with a tarp. So when you’re ready for the first cleaning of the year, you need something gentle and strong to bring your outdoor investments back to looking like new. CLR Outdoor Furniture Cleaner safely and effectively cleans furniture, umbrellas, cushions, children’s play equipment, awnings, barbecue grills — all made to withstand the elements, but still need a little help. Outdoor Furniture Cleaner contains UV protectants to protect furniture from fading and discoloration. This special formula is non-abrasive and safe to use on resin, plastic rattan, wicker, wood wrought iron, vinyl, PVC and canvas. It is biodegradable and will not harm flowers and grass. If you have outdoor furniture in need of cleaning, maintenance or placed on your deck, don’t hesitate to call our office, (301) 533.0111 – and we will take care of it for you.